As well as spraying with Magma Firestop fire retardant spray, there are many things you can do to reduce the risk of a thatch fire. Most thatched properties are individual and as such we recommend that the fire risk is assessed as such, often the fire service can help with this. Have a look at the Forensic Investigators report (Burgoynes) on the causes of thatch fires. This identifies 66% of the fires they investigated as being due to ejected embers from the chimney. Magma Firestop addresses the risks of ejected embers. Download the report and make an informed choice on your property. 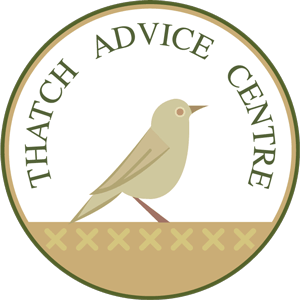 Have a look at the Thatch Advice Centre Fire Safety Leaflet for up to date advice on what you can do to improve the fire safety of your thatched property. Relevant Documents to help you Understand the Thatch Fire Causes, Risks and how to reduce them. With the Thatch Safe ® fire barrier over the rafters and then the thatch sprayed with Magma Firestop this gives the Thatch-Safe Model Plus. 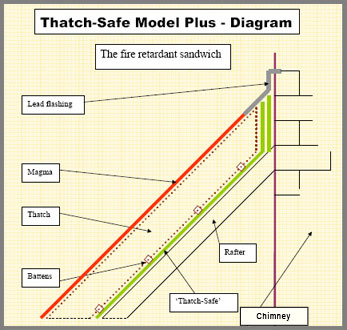 As we can see from the diagram the thatch has all the benefits of the THATCH-SAFE® and the Magma Firestop. This treatment to the top of the thatch gives an A rating for spread of flame. This means it gives added protection in the event of a fire hazard from sources such as Bonfires, Fireworks or chimney sparks. For more help with any aspect of this site or the Magma Firestop and Thatch-Safe® products please contact us. Any measures taken to reduce the risk of thatch fire are beneficial in terms of your peace of mind but also it can help with your thatch insurance. There are many specialist insurers for thatch who offer reduced premiums for those who can show that they are reducing the risk. Magma offer a Treatment Certificate for clients to show to insurers that their thatch has been sprayed to the standards required. Thatch properties are no more likely to catch fire than other properties, the problem is that if they do they are notoriously hard to put out because the thatch is designed to repell water. This can be very costly in terms of loss of property and insurance premiums. The benefit of Magma Firestop is that the spray is designed to help stop fires starting in the first place.